What or who are jinns? Who knows them, and through which traditions of Islam? Anand Vivek Taneja begins his gorgeous book with a scene at the Firoz Shah Kotla complex, a north Indian dargah, or built shrine to a saint or “friend” of God: A man turns from the light to the dark. Leaving behind the “illuminated stage” of a theatrical rendition of kings held at the complex, he walks through “dark and eerie” ruins past an “alcove lit with candles where a few people were huddled in prayer.” A sort of a staging, but for whom? The man hears “a voice, bodiless but resonant,” a “voice from the invisible”—a jinn. Though it “respond[s] to the pleas” of those gathered, only this observer can hear it. We are not sure at first who this man is, and, although we know it is a jinn speaking, we do not know what is said. Taneja offers this as an allegory for the kind of work undertaken in his book, which turns away from the “familiar spotlit history of kings and statist dramatis personae” to engage “another kind of relation to the past”—in which the particularity of a place makes it more, rather than less, accessible to knowledge. Turning from spotlight to candlelight serves also as an allegory for exploring the margins of Islamic discourse: Leaving the secure and spotlit staging of public knowledge in and about Islam, we must, as Jacques Derrida suggests, prepare to be unprepared for a singular encounter. Visiting Firoz Shah Kotla has much to tell us about Islamic epistemologies, and much to tell us about how to think about Islamic epistemologies. 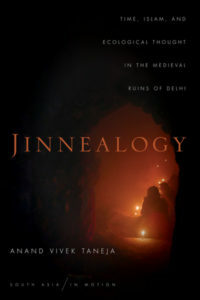 Jinnealogy, like other books in this forum, join a field centered since the late 1980s around Talal Asad’s conceptualization of Islam as a “discursive tradition.” Asad’s intervention was groundbreaking: It displaced Ernest Gellner’s engagement with Islam as “blueprint of a social order,” and rejected typologies of popular and scripturalist Islam which long divided ethnographers from textualists. Above all, it prompted anthropologists to think not merely about what “Muslims say Islam is,” but to ask when and where they say it—and do it. Following Asad, anthropologists have asked: In what historical and institutional positions do Muslims endeavor to embody Islam? Through what institutions and media, and with what political, social, and pious effects, does such embodiment take place? How do Muslims look to the tradition and to the future to enact Islam as “apt practice”? Like others in this forum, Taneja accepts key insights of Asad’s approach, but also points toward dissatisfaction with its heretofore accepted limits. In exploring new ethnographic terrain, it aims to break new theoretical ground. Jinns are a marvelous place to start, precisely for their violation of any boundaries between orthodox center and exiled margin: Jinns are mentioned in the Qur’an and Hadith, and are the subject of numerous Sufi and legal studies. But they spill beyond these discursive limits, inviting practices of piety and sociability that are neither simply nameable as “Islamic” nor limited to self-identifying “Muslims.” In Jinnealogy, Taneja brings all of this bear on how we—Muslims and non-Muslims—know and study and locate Islam as a discourse. Detailing the material sites of north Indian dargahs and the people and the animals gathered there, Taneja asks what forms of selfhood and sociability people cultivate in relation to jinns, and in relation to others in the space of jinns. As he suggests, these forms are liminal, exceptional. Though shaped by colonial brutality, Partition, and postcolonial violence and neglect as by orthodox reformist and revivalist Islamic movements, the forms of piety and community he details also exceed these frames. Most importantly, shrines like the exemplary Firoz Shah Kotla complex do so not just as liminal spaces but also as liminal times of knowing—“elsewhens” as much as “elsewheres”—which open the imagination of participants and observers to premodern conceptions of Islam. This is the “jinnealogy” that Taneja has so marvelously identified, which defies the constraints of modern state-mandated history and reform-minded religions, both Muslim and Hindu. It is this connection to another time—“let us call it ‘medieval,’” he says—and to other ways of knowing and of being a person and being together with others, which the shrines-in-ruins make possible. Toward the jinn-saints, visitors cultivate a medieval model of Islamic rule, one based on the sovereign’s attention to the particular subject’s complaint: Rather than approach the state as an individual in the form of Foucauldian governmentality, in which one’s value derives from aggregation within a quantifiable population, petitioners to the jinn-saint seek a relation of singularity. This Islamic way of knowing does not require rigid distinctions between Muslim and Hindu, nor between nation-states, nor between discrete languages. This way of knowing is an ethics of Gharib Nawazi (“hospitality to the stranger”), a profound hospitality that gives up any claim to one’s own sovereignty as host, that premises “people’s intimacy . . . on their being strangers to one another.” This stranger-sociability is not that of the modern metropolis or mass public; it is of particular persons, rather than serial subjects, who abandon legal names and religious identities. In other words, Gharib Nawazi does not merely expand the boundaries of “we” as an identity, but rather dispenses with the (modern) logic of identity all together. As Taneja’s friendships at Firoz Kotla attest—as he relives the union of a friend group and its bitter dispersal—this openness is very difficult to sustain. In tracing these medieval ethics and ways of knowing to Islamic traditions, Taneja thus seeks to expand the study of Islam beyond both Asad’s and Ahmed’s arguments, that is, beyond the identitarian terrains which both thinkers explicitly occupy. For whereas Asad and Ahmed seek to engage Islam “as Muslims do,” Taneja explores Islam not as identity at all, but rather as inheritance—a more diffuse logic of circulation and influence, which Taneja sees not only at the dargah but in visitors’ dream images and in Hindi cinema as “heir to the courtly grandeur” of the Mughal Dynasty and successor states (1526-1857). Islamic identity of course requires inheritance, but it is an inheritance of policed borders. Islam as inheritance is broader and less narrowly channeled. It is not merely Islam as a river, in which one might take a dip and leave refreshed; it is Islam that floods the banks and deposits nutrients in the silt left behind in the north Indian landscape. Among these Islamic sources of discursive authority and fascination are, of course, the jinns. These Islamically ambiguous figures—“figures of the transmission of memory beyond all possibility of human history”—destabilize knowledge and discourse: they raise hopes and questions rather than provide answers. In this sense, it seems to me jinns are figures of figuration itself, an impersonal and uncanny force of imagination, neither body nor symbol. Like inheritance to identity, this force of imagination so central to classical Sufi theories of the human soul, inhabits and motivates discourse but cannot be reduced to it, whether spoken or embodied. To know the jinns within the anthropology of Islam starts with unknowing: “We have lost so much,” Taneja writes, “that we are largely unaware that we have lost anything, even though we are surrounded, in Delhi, by the traces of the departed.” But rather than stop there, Taneja’s book helps open the “discursive tradition” to the mysteries of Islamic figuration—allowing traces, which are not signs, to be strange. His observations are gentle yet pressing, motivated by a deep sense of past possibilities, an urgency to make room for realms of Islamic tradition that need not be legible to be lived. Emilio Spadola (PhD, Columbia University, 2007) is associate professor of anthropology and Middle East and Islamic studies at Colgate University, visiting associate professor of anthropology at Tufts University, and president of the Middle East Section of the American Anthropological Association. His work examines theories of Islam, and intersections of religion, media, security, and modernity in Morocco and the Muslim World. His book, The Calls of Islam: Sufis, Islamists, and Mass Mediation in Urban Morocco (Indiana, 2014), was awarded Honorable Mention for both the 2014 Clifford Geertz Book Prize by the Society for the Anthropology of Religion, and the 2015 L. Carl Brown Book Prize by the American Institute of Maghrib Studies. He is a 2018-19 grantee of Notre Dame’s Global Religions Research Initiative, studying Moroccan Sufism, security, and diplomacy.